You’re hot, the sun’s beating down, and you left home without your hat. How can you create a little shade for yourself? Well, you could take some inspiration from these ladies and repurpose your newspaper. That is, if you can still find one in a pinch. 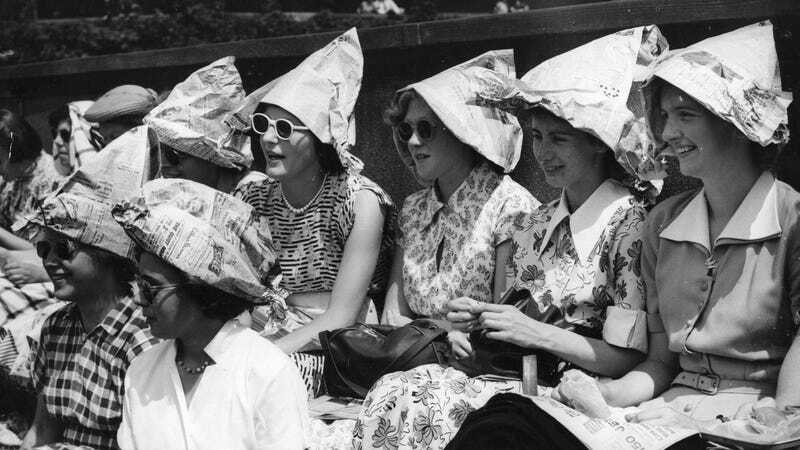 Here we have, as per the caption, “Spectators at the Wimbledon Lawn Tennis Championships wearing newspaper sun hats,” circa 1952. This was apparently quite a popular trick for coping with the heat in the era before air conditioning—especially, for some reason, at Wimbledon. Here’s a group of schoolgirls a year later, shielding themselves similarly. A trio attending 1954. Is that woman wearing The Daily Mail? The best solution, however, is forget Wimbledon—fashion yourself a sun hat and find a cool tub of water somewhere.